I'm a huge fan of cheese! My new-found favorite cheese to cook with is Lifetime fat free cheese (which was actually my favorite low calorie food find for 2008), but I'm always on the lookout for low calorie cheese to snack on as well. So, I was pretty excited when I found these Laughing Cow Gourmet Cheese bites at my local Safeway. Inside the box are 25 individually wrapped cheese cubes (just like people serve at parties on toothpicks). But what makes these different from what you eat at parties is the fact that each one is only 7 calories and approximately a third of a gram of fat. That means that 5 of them (one serving size) is only 35 calories and 2 grams of fat) -- so one weight watchers point. Or, if you just want to eat one for a quick nibble/snack, eating two is zero weight watchers points. These little cheese bites are a perfect solution to a cheese craving! Wow, I haven't seen these yet, but I want to try! I love, love,love these little cheese bites!! Actually, I love all things Laughing Cow! What a fabulous find! 5 of them for 35 calories? Whoo hoo! 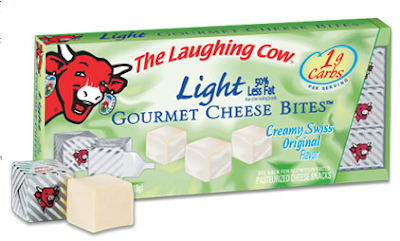 I adore the laughing cow light cheese wedges, so I'll have to give these bites a try! Such a calorie bargain. I've only seen the wedges! I hope I find these, too! oh yesss - i love cheese. hopefully these pop up in a store near me soon! Laughing Cow is seriously the best low cal cheese ever! I haven't seen these before - I'll have to check it out! For anyone in the NJ area ... found 'em at ShopRite! I'll have to look for this! At my last trip to the gym, someone was giving out free Laughing Cow samples. I had never had it before, and now my fridge won't be complete without it. In Europe you can get these in all kinds of flavors, salmon, ham, goat cheese, pepper, olive, pimento, onion, tomato, you name it, they're amazing! I've looked for YEARS for the flavored ones in the US. Has anybody seen them here? saw these for the first time in Paris last week, so bought some back to england with me! they are soooo good. Now just got to find out where to buy them here!! !